Michael was recovering from a surgical operation and had not been able to prepare as fully as he would have liked. We started off on our trip during the wettest period of the year, just as the tailend of Hurricane Bertha passed over the South East of England. Our ferry to Dieppe on the second day was delayed by the choppy sea conditions, and we had a relatively long ride to our first B&B in France starting only from Dieppe in the late afternoon. It being August, most shops and restaurants were closed on the way, and we struggled to find food at the appropriate times of day. These videos provide some vignettes from the ride, and will hopefully give a good overall impression of our enjoyment thereof. We followed the Donald Hirsch route from Dieppe to Paris (as were all the other cyclists that we met en route! ), while on the first day Michael ably navigated us from East Surrey to Alfriston. The days are in reverse chronology below. I will put up some information about the 2013 ride (which two of the party did) in due course. A very pleasant ride into Paris via on and off-road routes comprising of forestry roads, parks and off-road cycle paths. Fortunately this day was almost entirely dry as I would have worried about some of the forest tracks becoming muddy. We stopped for a tea break in Versailles (and had a 3pm lunch in Paris near Gare du Nord). The video ends at the Eiffel Tower, but from there we made our way to Gare du Nord where the band of cyclists split up. Michael made his way home on Eurostar and the rest of us checked our bicycles into Eurostar and then went to a nearby rented flat. Some other members of the family drove over from England and we had a long weekend in Paris. Another short day, with a few climbs, and a glorious long descent down to the Siene at Triel: 2013 ride and 2014 ride. Again we had struggled to find somewhere to eat during the day, but this time we stopped early in the morning and bought baguettes at a boulangerie, so we had lunch with us. At midday we came across an Italian man cycling with this son who were having the same problem. Later I advised him on where to find a supermarket but he had persuaded a shopkeeper who was doing summer repairs on his cafe to open for him. The shopkeeper in turn phoned his friend from the grocery store across the road and persuaded him to open to provide food for the Italians’ sandwiches. Having crossed the Seine for the first time, we stayed in a cheap but cheerful hotel (after using B&Bs up until today), and had another comfortable night. This was one of two short days (David and I had split day 3 from the previous year into two days, for the benefit of the new joiners of 2014). Unfortunately all the restaurants and shops were closed along the way. We survived on brioche and cake that Sophie had sent us away with from her B&B in the morning. Near our destination we made a detour to a larger town (Chaumont-en-Vexin) to buy some supplies. Generally the terrain here (once we reached the plateau) was rolling hills through farmland and towns. We stayed at Le Clos in Fay-les-Étangs where we also managed to wash some shirts and shorts and hang them up to dry. One of the fellow guests at the B&B was from Belgium and reminded us of Obelix. 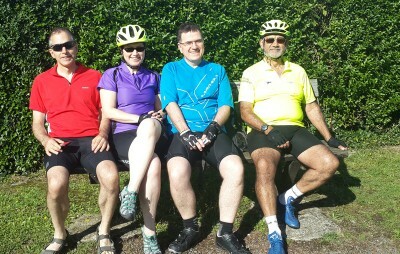 The video picks up at the start of Day 2 as we make our way along the Alfriston Road to Seaford, and then Newhaven where we catch a ferry with many other cyclists. We embark at Dieppe and the video shows us making our way to the Avenue Verte cycle path, and making our way along it in the direction of Dampierre-en-Bray. The ferry had been delayed over an hour, so we left Dieppe late and made slow progress. We did stop at the supermarket outside Dieppe but had not stocked up with provisions and all the shops and tea rooms along the way were closed. We met some interesting people on the way, including a cousin of the famous Donald Hirsch, mastermind of the route we were following. Eventually we rolled into Dampierre-en-Bray after 10 pm. Sophie and Erik, our B&B hosts, provided a delicious meal and we crashed for the night. My joke video Bloody cyclists! (Two abreast and in the middle of the lane) was also filmed on this day. We left Oxted and made our way to a rendevous point with Michael near Blindley Heath. We then had a very wet ride down to Uckfield where we dried off at a friends house and had a hearty pub lunch. The video ends before we get to Uckfield, and so doesn’t show the glorious afternoon ride from Uckfield to Alfriston where we overnighted at the Youth Hostel. This day some other riders faced a more formidible challenge from the weather, those doing the Surrey 100 (reduced to 86 miles due to the hurricane and flooding). We cycled to Paris over 4 days from 31 July to 3 August 2013. For some reason I haven’t edited this footage yet, but it will be put here when I get the opportunity.